Can someone please ID these springs? I was looking through the archives trying to determine who made these springs. I found one old post that said light blue springs were early ST springs and prone to sagging. 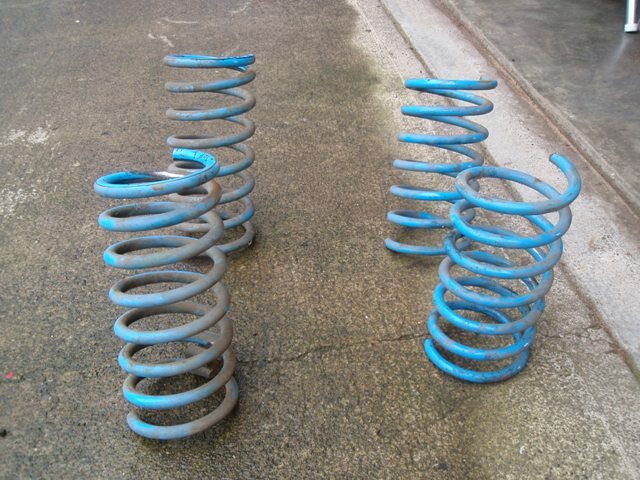 Can anyone verify that these are those early ST springs or not? I don't want to put these back on the tii after completely rebuilding the suspension if they are going to be the weak link down the road. Thanks, any help is greatly appreciated. you don't see any numbers stamped on the coils anywhere? Yup, you got you some springs, there! That out of the way, were they on the car when you got 'em? sag, they'd have done it already. They are indeed S/T springs. There will be notches on the pigtails. 1 notch is front and 2 notch is rear. They're decent springs. When they went blue(started with gold, black & now blue or green), their construction turned to cold wind. Similar to H&R and Eibach. The big diffrence is that S/T used domestic spring steel vs metric.